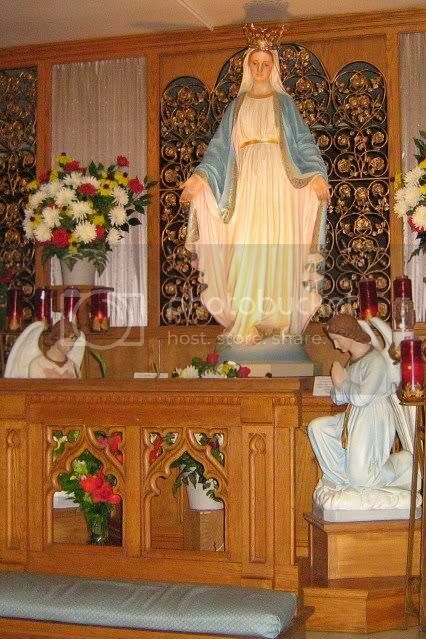 Now that this site has became the first (and only) approved Marian apparition site in the COUNTRY, no trip to the Green Bay area would be complete without a visit. Church approval came on December 8, 2010, about 150 years after the Blessed Mother appeared to Sister Adele Brise (October 9, 1859) and told her to teach the Faith to the local children and to admonish sinners. This was, by the way, one year and eight months after the Blessed Mother's appearance to St. Bernadette at Lourdes. This site was also the location of an amazing miracle amidst the Peshtigo fire of 1871. (About 2500 people perished in that fire.) With the tornado-like flames approaching, nearby residents brought their livestock and families to the convent grounds, now the shrine location, for protection. Not a person, animal or building within were harmed in the fire although it came so close as to leave its mark on the perimeter fence of the grounds. Everything in the area outside of the grounds was destroyed. I understand there is more information about this at the Peshtigo Fire Museum. The mailing address for the shrine is New Franken but the actual location is closer to Champion, WI. From Green Bay it will take you less than half an hour. When my family and I visited, a map of local restaurants was available in the shrine gift shop. A good variety of food choices range from bowling alley food to fine dining. The site is struggling to keep up with a dramatic increase in visitors since the approval announcement. At the time of our visit in July of 2011 there was a nice, new parking lot. There were bathrooms and some basic services (like a gift shop). There was no air conditioning in the chapel or crypt. There is a main church which houses a relic of Our Lady's earthly garment that, although very small, is really worth the trip alone. There are also two small relic remainders of the actual trees, between which the Blessed Mother appeared to Sister Adele. The church and crypt altars now stand on the original location of the trees and the apparition. Under the main church is a smaller crypt chapel (above left). 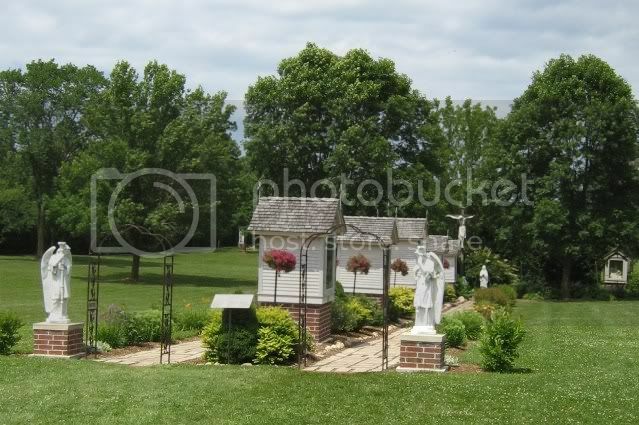 There is an outdoor rosary walk and stations of the cross (picture at right) . 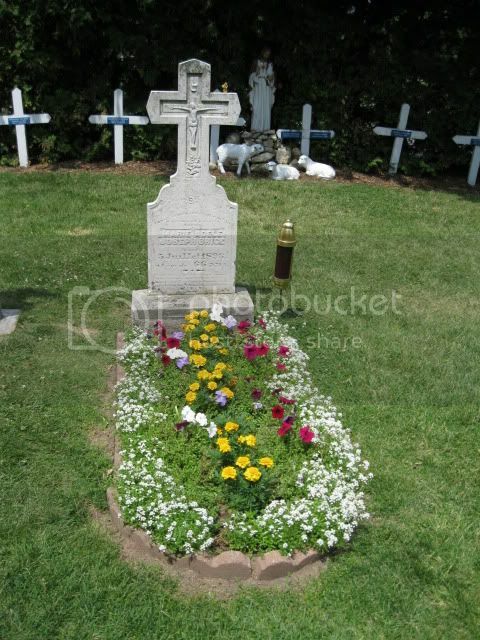 You can also visit Sister Adele's grave (below). It is worth mentioning that there are many claimed healing miracles associated with this site. Wisconsin Catholics should definitely make time for a visit to this very special place, not far from home.